Personal Positioning for the Caregiver: Ways to Stay Mentally Healthy While Caring for your Patient, by Jill Gafner, is a highly personal account of Gafner’s first 15 years of caring for her husband who had a series of health issues beginning with his diagnosis of double lung cancer at age 35. Gafner’s journey as a caregiver has been about as challenging as any caregiver’s journey can be. She gradually made up her mind that attitude makes all the difference. She practices what she preaches often using humor to buffer herself and her family from the hard knocks of their lives. Jill maintains the belief that no two days are alike and with any luck tomorrow is always a better day. Personal Positioning is about one courageous family that figured out that life doesn't have to be "normal" to be great. Often Jill would say, if you want to experience "normal", you may want to visit the neighbors, normal doesn't live here. The slim book, less than 60 pages in length, packs a wallop. Less like a book and more like a journal, it inspires with wit and humor. Gafner completely avoids pathos. 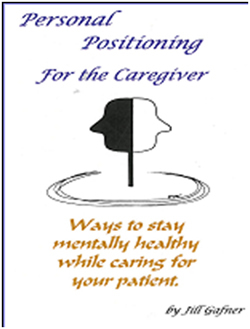 Purchase Personal Positioning for the Caregiver. $10.00 US.